USSD stands for Unstructured Supplementary Service Data. 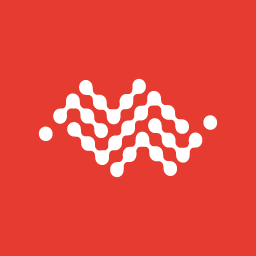 It is a connection oriented service to send messages to cellular devices. As a connection oriented service, the device shall be online for the message to reach it. Using USSD, you can establish real-time interactions between your application and the device implementing a request/response exchange. The USSD session can either be server or device initiated, and the server will terminate the session. To send/receive USSD messages to/from a device, your IoT application will need to interface with our USSD Gateway. To use USSD your offer needs to have this service authorized. The service also needs to be enabled on each subscription with which you want to use USSD. As part of the request to enable the service, you will be required to specify the HTTPS callback URL to be used, and as a result you will be attributed a dedicated short code (mapped to your callback url) and specific credentials to use the USSD API. If you wish to enable USSD on your offer, please contact your usual SIERRA WIRELESS sales representative. The capability to push USSD message to any of your device (Server initiated USSD) is provided via a SOAP API. 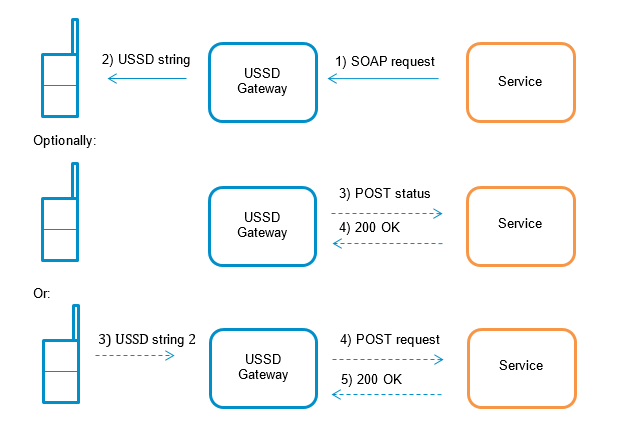 In the Push scenario, your IoT application will invoke a SOAP request which will trigger a USSD emission from the USSD Gateway to a device identified by its phone number. For more information and access to the wsdl, please refer to the USSD API developper's guide . In the Pull or Device initiated scenario, a subscriber’s module will emit a USSD short string, encoding your dedicated short code and optionally an additional string, for instance *774#string1#, which will trigger an HTTPS POST request to a customer URL previously mapped to this USSD code. 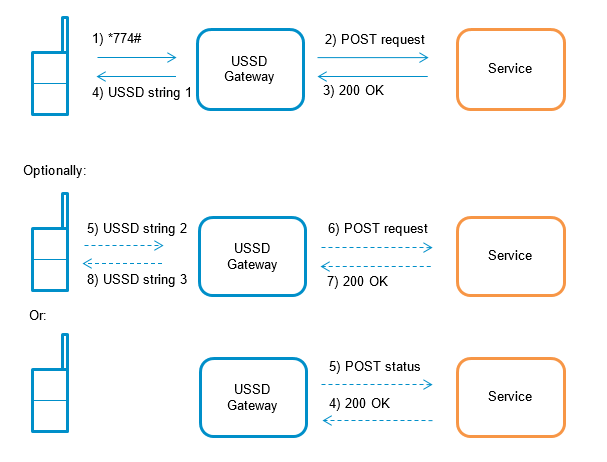 For more information about how to develop your server for sending and receiving USSD, API sample requests and code samples, please refer to the USSD API developper's guide .